The number of properties in Weston-super-Mare at risk from coastal flooding has now been estimated at 5,009, not 1,800 as previously thought. If the sea defences are breached, 54 properties face being under two metres of seawater and 1,129 properties could be flooded by one metre of water. Research by North Somerset Council has found repairs could cost £2bn. Councillor John Crockford-Hawley said: "There is a clear concern not just for buildings but for life itself." The main areas at risk include the sea front between Knightstone and the Grand Pier as well as between Melrose Park and into town. 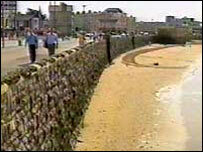 The council wants to strengthen the current Victorian sea wall by inserting concrete into it and raising the height. It also wants to build a secondary splash wall from Knightstone to the pier which would contain any water which would otherwise head into the town centre. The system, which is estimated to cost between £7.5 and £10m, is awaiting approval for funding from Defra. The council has already spent £500,000 on strengthening the town's defences. "I urge all townspeople to support the council's application for government financial support. "We must build the new sea defences as a matter of extreme urgency; nothing must be allowed to hinder this urgent work. "Rising sea level is not an hydrographer's theory - it is a reality and needs to be addressed," he said.